Lymph nodes are also known as lymph glands and these are small lumps of tissue which are a part of body’s immune system. Lymph nodes consist of white blood cells which act as the body’s active immune system, by filtering harmful substances like bacteria and cancer cells from your body. Lymph nodes are located throughout the body in places such as neck, armpits, between lungs, around gut etc. Lymph nodes fight infections by filtering lymph fluids which is composed of fluid and waste products from your body tissues. These nodes help in activating your immune system in case of an infection. Lymph nodes play a very important part in diagnosis of many conditions such as cancers to simple infections. It is accomplished by inspection and palpation techniques for Lymph node examination. 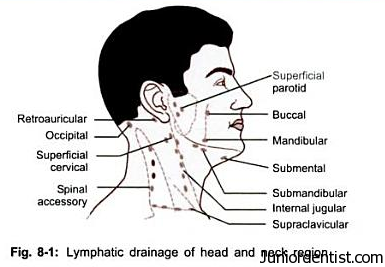 Head and Neck Lymph nodes are variable and the lymphnodes which are accessible for palpation in the Head and Neck region are Occipital, Parotid, sub Mandibular, Retroauricular, Sub mental Lymph Nodes. Waldeyers Ring is a Lymphatic ring in the neck region. Deep Cervical Lymph Nodes: Lies below the Sternomastoid Muscle and over the Cervical Fascia. Lymph nodes play an important role in diagnosis of many cancerous conditions in many parts of the body. As Lymph nodes filter harmful substances and waste products, with the presence of immune cells inside the lymph nodes it helps in destroying cancer cells and bacteria in the lymph fluid carried to your lymph nodes by lymphatic vessels. So in case cancer is suspected in the body, the related lymph nodes are palpated and examined and in some cases aspiration or biopsy is also performed to help in diagnosis. Lymphona is the cancer of Lymph nodes where the cancer starts in the lymph nodes and spreads to other parts of the body through lymph vessels. This was really helpful in my viva today, thanx a lot. I would like to know what the function of Lymphnode is in detail.